A new brand to explore, always nice! Especially when it's as promising as KWZ Ink (KWZI), a young, Poland-based brand ran by Konrad, a fellow chemist (+1 for fellow chemist buddies!). It's somewhat hard to come by their inks, apart from a handful of stores that offer them. Of course Konrad has a website of his own where you can order them directly, but it's not a full-on store. I didn't actually know of any nearby stores that had these inks for sale, until I visited Sakura Fountain Pen Gallery in Diest (Belgium) a couple of weeks ago! This relatively new B&M store, located just a short trip from my home (yay! 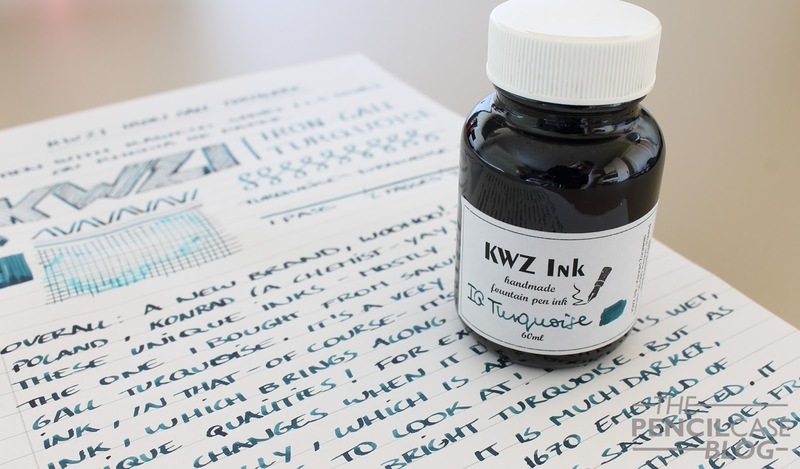 ), offers a rather complete range of inks from various brands, of course including those from KWZI. What made me buy this specific ink, apart from the really pretty color, is that it's an Iron Gall ink. For those that aren't familiar with the term iron-gall, a bit of chemistry 101: iron gall, the name says it all, consists of an iron salt (for example iron(II)sulfate, FeSO4) an Gallic Acid extracted from plants or trees. The iron oxidizes because of the exposure to air when you write, which causes it to form special compounds, which shows as the darkening of the ink. This is the main attraction of iron gall inks, because these formed compounds are a bit more permanent than what normal inks can do. But enough about the chemistry, we want to know what it looks like: well...it looks awesome! I'm not gonna lie, IG Turquoise is a fascinating ink to use, even if it were just to see it go from bright turquoise to a dark, somewhat teal-ish color (the darkening, again, due to the iron content being oxidized by exposure to air). the color on itself is right up my alley, something I can see myself use quite a lot because it's a more subdued, yet saturated color. As if it were a blue-black ink balanced more towards the blue side, only this time it's teal! I also love the shading it creates. It's a well-defined shading, almost black in some areas! There's some slight amount of reddish sheen to be found where ink pools, but it's nothing major. It's a well-behaved ink overall. It doesn't give the wettest flow, yet I expected something drier from an iron gall ink (I didn't really know what to expect since this is one of the first iron gall inks that I purchased!). Of course it's supposed to be more permanent than average, but in reality it's not really that noticeable. Most of the color isn't waterproof, and gets washed away, only the iron compound stays behind, which leaves a faint greyish mark. Of course, modern iron gall inks also aren't as concentrated as they used to be, to remain safe for fountain pen use, so the effect obviously isn't as strong. That being said, it's not a bad thing to have, and in modern fountain pens, especially those with gold nibs, you can't really do something wrong with it. You just have to flush your pens more often if you want to be safe! There's not a whole lot more I can say about this first encounter with KWZI inks, other than 'it definitely won't be the last KWZI ink I buy!' It's a lovely color -personally one of my favourites from their iron gall product line-, and it has lovely, deep shading. The fact that it's a bit more water-resistant doesn't matter too much for me personally. The difference is marginal, but on the other hand the lesser concentration means that it's safer to use than old IG inks (I've had it in my Pilor VP non-stop for the past five weeks or so, and even with little use it's still perfectly fine!). If you want a bottle, a quick google search will lead the way towards the few online stores that sell it. If you happen to live in Europe (or like to buy overseas), I'd recommend checking out Sakura Fountain Pen Gallery, they also have a nice assortment of other less frequent ink brands available! 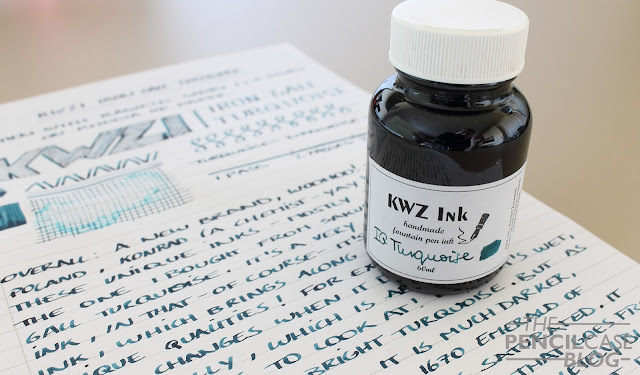 Prices for the KWZI iron gall inks are 15 EUR/ 14 USD, the 'normal' inks go for slightly less. this looks great. Till now I have got my iron-gall inks from Abraxas in Basel (near where I live) He only makes a black as far as I know, and it is very dark grey compared Platinum Carbon Black. But I do like it. He has an online shop but his inks are in high end pen shops here in Basel and Zurich.